So we’ve been in our flat for 2 and a half years and I can’t believe how quick time has gone. Over these past couple of years we have learnt (or should I say, I have learnt) how to accessorise our flat in a way that suits us. We have found some nice little touches that make our flat all cosy and homely and at an affordable price too. However, there are still a few things we want to get/do for example we would like to replace the bathrooms. The other area we would like to update/ renovate is our kitchen. The kitchen hasn’t been updated since the flats were built so it’s in need of a good update! I would like to completely rip it out an start again to be honest. Even so far as buying all new plates and glassware like these champagne coupe. They look so premium and would totally impress my family when they come round for Sunday dinner (yummy). But for the rooms we have finished there are a few finishing touches that totally completes the look and feel and this is what I wanted to share with you! I absolutely LOVE a candle! There’s nothing like walking into a room and smelling the beautiful scent of a freshly lit candle. I’m not really fussy when it comes to scents, but I do quite like a sweet smelling one. 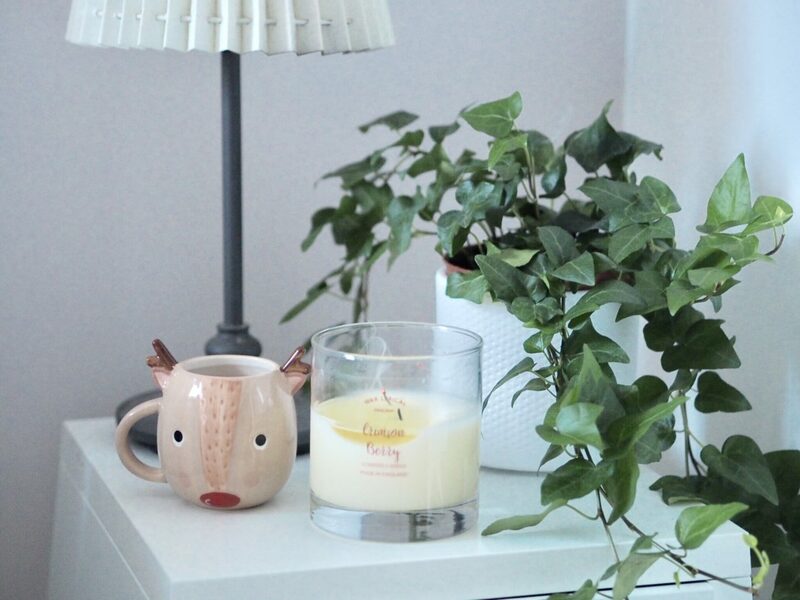 I especially love the Christmas candles – give me all of the cinnamon and berries! I can literally smell it now. There are lots of places we pick up our candles from. Even the supermarkets like Tesco and Asda do some reasonably priced candles and they normally smell amazing too. But I think my all time favourite place to pick up candles from is TK Maxx or Homesense! You either love em or hate em OR you’re just plain rubbish at keeping plants alive (I may be guilty) but they do look nice propped up on a window ledge or placed conveniently in the corner of the room filling the space. My favourite type of house plant is probably the one in this photo, Ivy. I just think it’s so nice to add something a bit different to a shelf or table, and they really are cheap. You can pick these up from most garden centres and they’re not going to set you aside much at all. Another way to easy accessorise your home is by hanging some wall art/ prints on your walls. Or even propping them up against a wall on a chest of drawers or something. This is something I want to buy more of as I think they can make any bland wall or room look instantly more interesting. There are a few sites to buy nice wall art from, the place I like to look is Desenio – they have such a lovely range of prints to choose from, from really simple ones to more eccentric but there’s something to suite everyone! Something else we’ve introduced to our flat is some hanging shelves. They are pretty simple to make and look really authentic. You can pick up some good sized pieces of wood from B&Q or somewhere similar and all you need is some rope and voila. If you know how to use a drill (or get someone who does – like I had to) you can drill some holes for the rope to go through and hang the rope from the ceiling. Either that or something a bit simpler is to buy some brackets and simple place to length of wood on the brackets to sit and there you have a rustic wooden shelf! Do you have any tips or ideas on how to accessorise your room or home? I love a good house plant… although I killed our last one over the summer. In the new year I want to decorate more of our house. Putting photos up of family and friends, more house plants, a shelf above our bed so I can put prints candles and maybe one or two fake ivy plants as they look so lovely. You defiantly have an interior eye and I loved your hanging shelf you made.